Durcor® Lap Joint Flanges are manufactured from PureFlex proprietary advanced fiber reinforced composite. 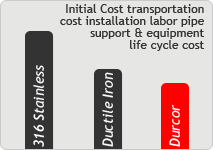 Durcor® has tensile and compressive strengths that rival steel along with outstanding impact resistance that is unmatched in the industry. Its reinforcing fibers are long and interlocked; this interlocked reinforcement system transfers loads throughout the fiber matrix, making Durcor® flanges virtually indestructible. 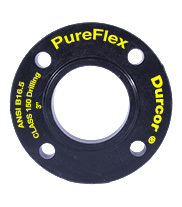 The strength of Durcor® enables the flanges to maintain CLASS 150 rating and ANSI B16.5 dimensions and allows it to be installed in any type of piping system without the need for special considerations. Durcor® Flanges excel in temperatures from -60°F to +300°F and has only .001" of thermal expansion across its full temperature range. Notched Izod impact strength of 30 ft. lb/inch per ASTM D-25 or 1760 JIM are achieved. Durcor® vinyl ester resin backbone provides excellent protection when exposed to aggressive chemicals and hostile atmospheres such as acid sprays, bleach, salt water and high chlorides. Durcor® Flanges out-perform stainless and ductile iron flanges not only in corrosive environments but non-corrosive as well. Its lightweight advantage reduces the need for heavier support structures for hanging, eliminates the need for extra equipment and personnel for pipe and fitting installation and reduces pipe strain once installed. Durcor® Flanges are so dependable and maintenance free that we offer a 5-year "bumper-to-bumper" warranty. Contact PureFlex or your local distributor for details. 1" 1 1/2" 2" 3" 4" 6"